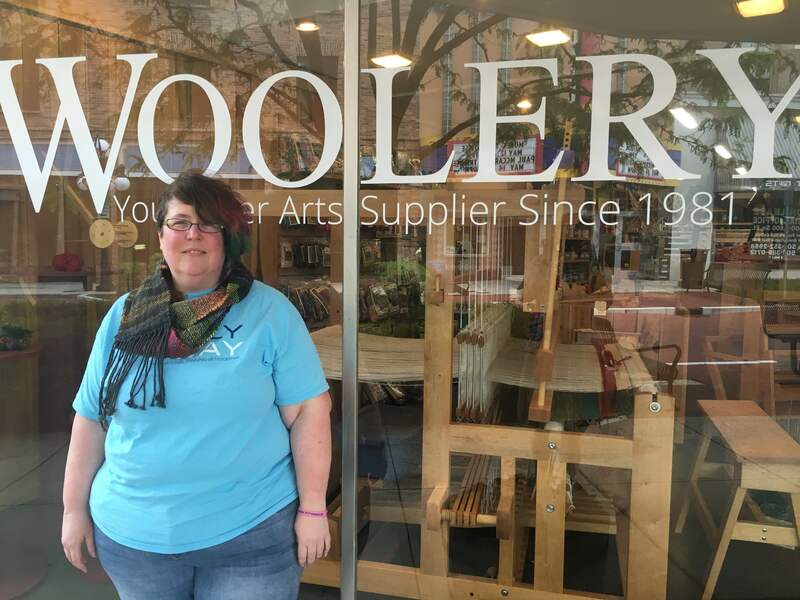 Last month's first-ever Ply Away retreat in Kansas City was an exciting adventure for Team Woolery! Perri, Taevia, Jesse and Lacy loaded up a truck with all kind of spinning wheels, fibers and other tools and supplies with Kansas City, MO as their destination. The retreat took place in a gorgeous hotel downtown that had a waterfall in it - how cool is that? 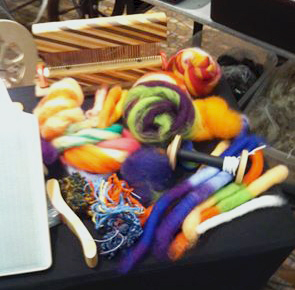 We had several different types of spinning wheels set up for folks to try in our booth - and of course, lots of spinning fiber to play with, too! Our friends Otto and Joanne of Strauch Fiber Equipment were conveniently located next door, which ended up being quite fun - both Otto and Joanne are wonderful people we enjoy spending time with any day of the week! 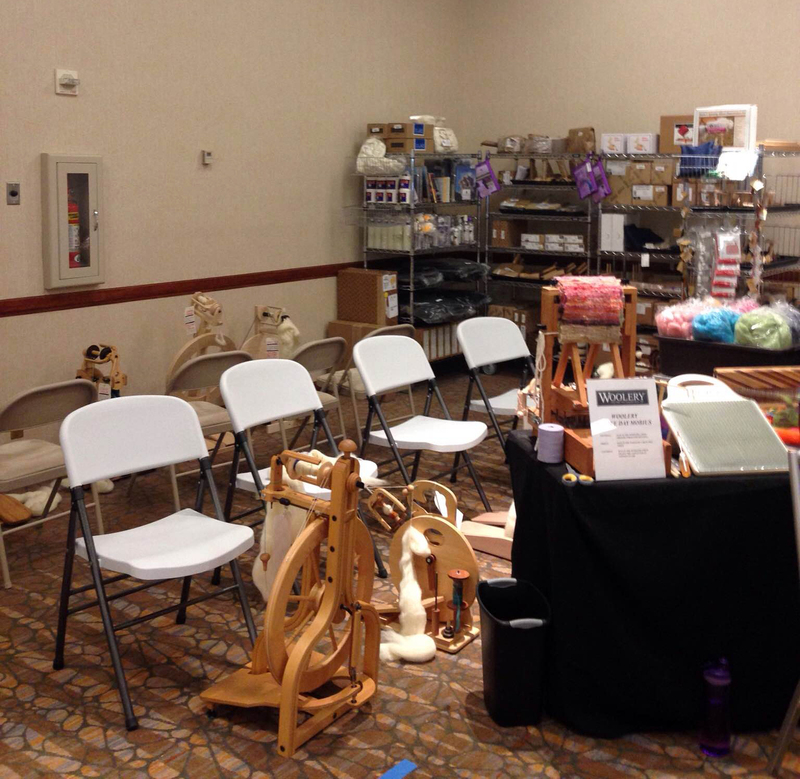 As an added bonus, we were able to borrow their swift and ball winder, as Lacy did here with an impromptu live demonstration as she winds off some yarn! 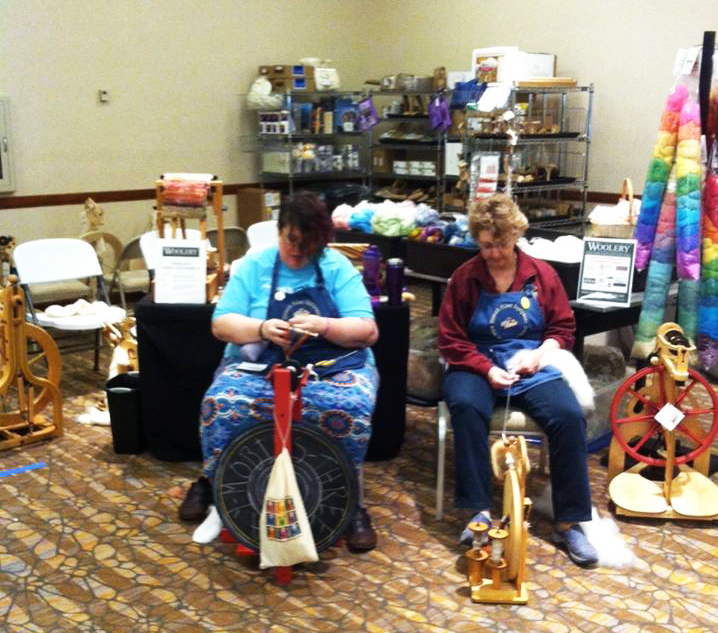 Taevia had some company when Joanne Strauch stopped by to enjoy a few quiet minutes of spinning time together! When Day 3 rolled around, the yarn was spun and it was time to start weaving, with the resulting cowl looking quite marvelous! 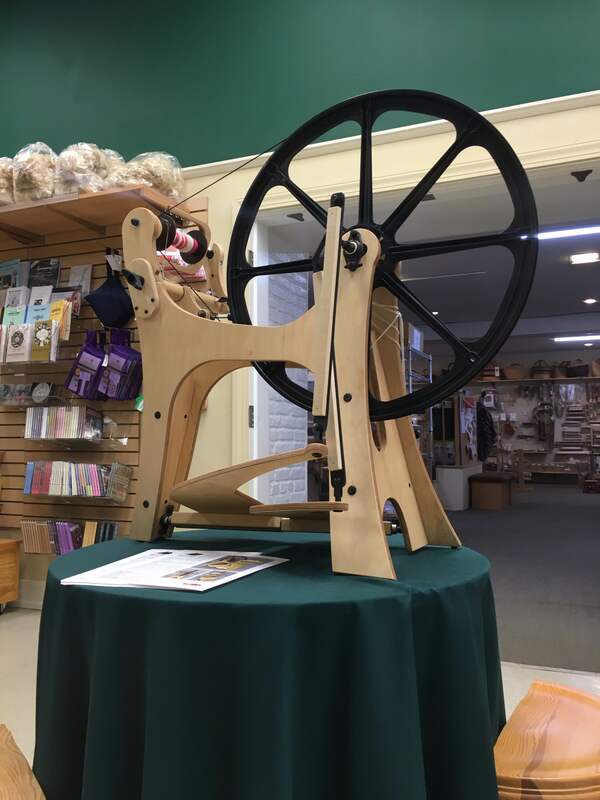 Perhaps most exciting of all, we got a first look at the protoype of a new spinning wheel which will be arriving later this year from the Schacht Spindle Company! The Flatiron was inspired by the iconic Flatirons rock formations which tilted up from a horizontal position millions of years ago. 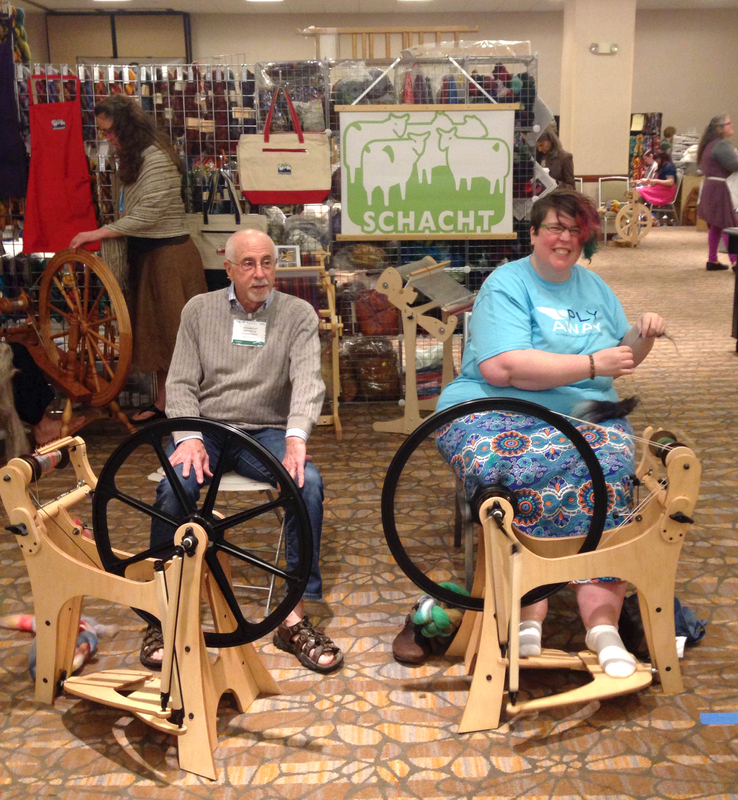 Below, Barry from Schacht and Taevia spin on the two Flatirons which were on display in the marketplace. As you can see above, the Flatiron is a Saxony-style wheel, but it is anything but traditional! 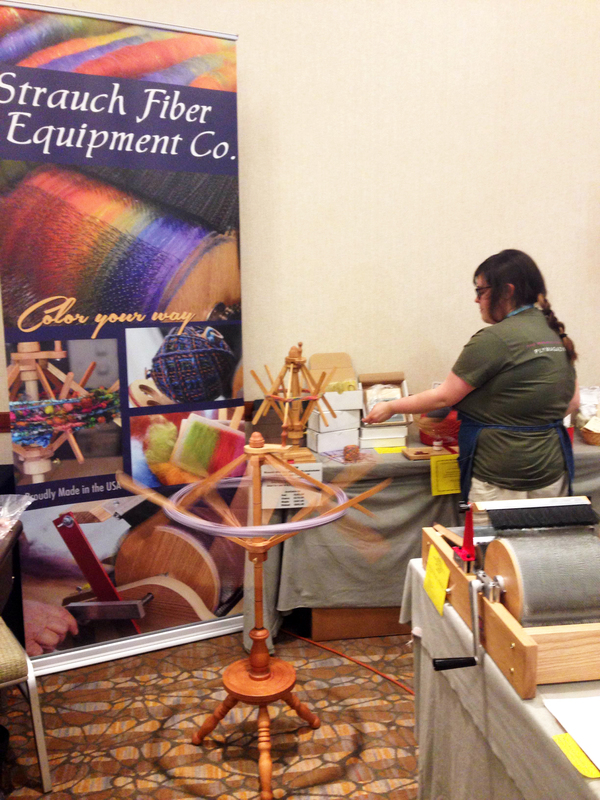 Fully customizable, it can be built to your spinning preference, with the flyer on the left or on the right. You can choose from Scotch, double drive or Irish tension, and the Flatiron features a clever quick release lever to make changing out bobbins fast and trouble-free. Other features include self-aligning bearings in the maidens, a fully adjustable drive wheel, and an innovative threaded tension control. 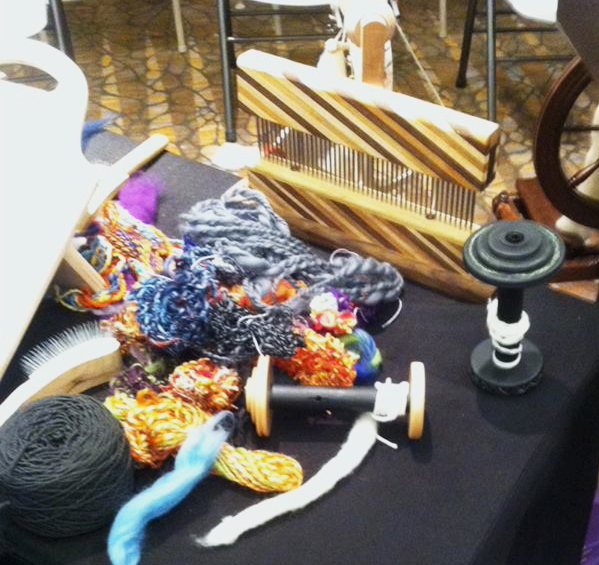 The wheel comes with everything you need to spin, even the tools to assemble it - just add fiber! The consensus at Ply Away? The Flatiron should be on your must-try list for fall...but you don't have to wait til then to try it!We were lucky enough to bring home on of the prototype wheels, which is now on display in the shop. We are eagerly awaiting the arrival of more Flatirons in the shop and will keep you posted about their ETA!